Eating too much pizza together. Smelling your cats. Figuring out how to spend your evening when the internet has suddenly stopped working. Relationships are full of sweet and quirky little moments! 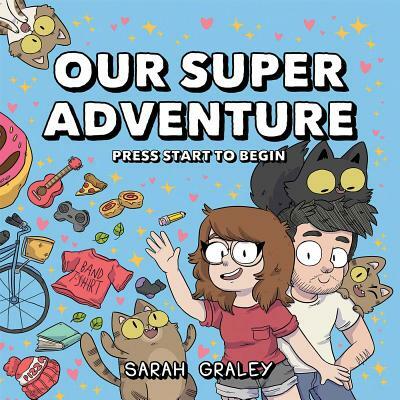 Sarah Graley’s first collection of the hit diary webcomic Our Super Adventure chronicles two years of these strange, relatable instances, as she navigates life with four cats and one cat-like boy. Whether it’s that feeling of getting the entire bed when your partner gets up before you, or the heartbreaking realisation that the love of your life has burned the microwave popcorn, Press Start To Begin documents all the weird little everyday flashes of shared absurdity that make up a relationship.